The inspiration for your shop name comes from the nursery rhyme (I assume). Could you tell me why you chose it? Sing a Song of Sixpence is the inspiration for the name. A close friend of our family had suggested we look to nursery rhymes for naming inspiration - it's all over the place in many of those rhymes. We wanted a name that had some familiarity and association with pie, but that wasn't too obvious or cute. We liked the light and dark aspects of the rhyme and macabre humor. What is your most treasured/used pie baking tool? Emily: I like a solid and well balanced tapered rolling pin for rolling dough. Emily: Any pie that is made with fresh, in-season fruit - particularly stone fruits and figs, and rhubarb of course. What's your baking story--how long have you been doing it, who taught you and how did you learn? Any funny stories from those first (or later?) baking experiments? We grew up in Hecla, South Dakota where our mother owned and operated a local family restaurant with her two sisters, our grandmother Liz baked all the pies and we worked there as soon as we were big enough to wash a dish! We both went in different directions for college - I came to Brooklyn to study art and Melissa studied finance and then traveled New Zealand and Australia for a couple years. We reunited in Brooklyn and started baking together and realized that we had the potential to make it a real business. 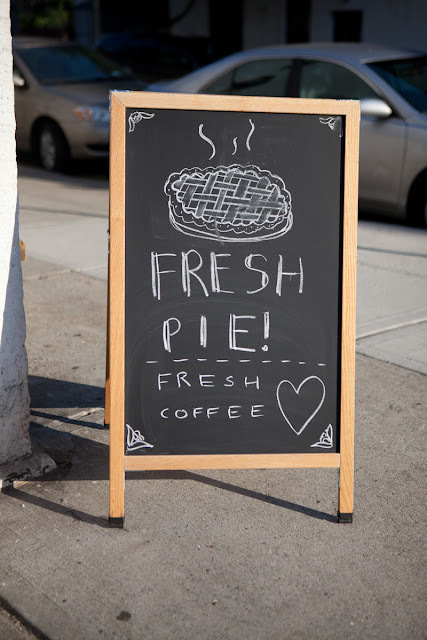 At the time, it was hard to find good fresh pie in NYC on a regular basis and we wanted to make a place that was devoted to it because we loved making it and eating it of course! We love the simplicity of it, and yet it has so many creative possibilities - we felt we could do something new with it. Also, I'm particularly attracted to it as a sculptural baked good - pie crust is fun to work with once you get to know its ins and outs. It seems like you guys are really into bikes too. Is there any kind of bike-pie connection? Pie racks on your bikes for easy transportation? We are both really into bikes for transportation and distance riding for exercise - we live close to Prospect Park which is great for cycling laps, and doing a distance ride up the West Side highway and into Jersey is one of my favorite ways to spend an afternoon. We have a lock and pump at the store that we let customers use and we sell tubes and patch kits as well. We are not bike racers, but we love the bike community in Brooklyn which is growing every day. No pie bike racks yet, but we'd love to do bike delivery one day! 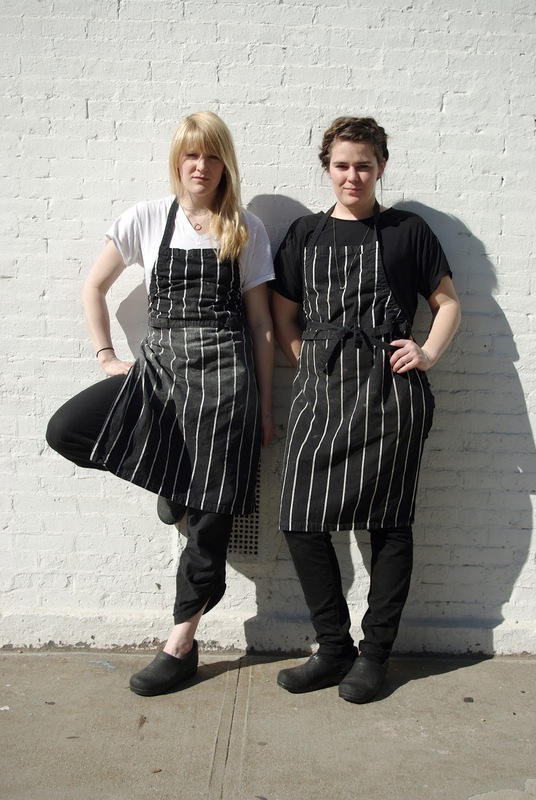 Emily: For me, my sister is the perfect business partner. We are very different personalities, so we balance each other - and we are close enough in age that we like doing the same things and our interests align well. It's not without difficulties, arguments and such, but she is the one person I truly trust to have my back, though I know I drive her crazy sometimes. What's your favorite music to listen to while you're in the kitchen? I'll listen to (almost) anything and I'm always changing it up... lately I've been getting into older reggae, and some newer stuff, as well as a lot of hip hop. I like good rhythm when I work. Any words of advice for new or aspiring pie bakers? Be prepared to work hard in this industry and be in love with what you are doing, keep a positive attitude and always be curious to learn more. 1. Stir flour, salt and sugar together in a large bowl. 2. Add butter and coat it with flour using a spatula or bench scraper. Working quickly, cut butter into the flour with a pastry blender until mostly pea-sized pieces of butter remain (a few larger pieces are okay; do not over-blend). 3. Sprinkle four tablespoons ice water over the flour mixture and cut the water in with a spatula or bench scraper. When water is fully incorporated, add more water, one to two tablespoons at a time, and mix until the dough comes together in a ball, with some dry bits remaining. 4. Squeeze and pinch with your fingertips to bring all the dough together, sprinkling dry bits with drops of ice water if necessary to combine. 5. Shape into a flat disc, wrap in plastic and refrigerate for at least an hour, preferably overnight. Wrapped tightly, dough can be refrigerated for 3 days or frozen for one month. 6. Roll out to fit the bottom of the rectangle pan, just to the edges, not over. Use the scrap to create about 20-25 lattice pieces to fit the pan width and length. Combine the wet ingredients with the dry. Scoop into pie shell, with most of the liquid - but do not make the pie too watery, the Rhubarb should be just slightly covered in the liquid. Arrange lattice on top, crimp edges in. 1. Brush the top of the lattice with the egg wash and sprinkle with raw (or demerara) sugar. Bake on a half sheet pan at 350F for 30 minutes, rotate and bake for another 30 - 40 minutes - depends on oven strength. Look for a golden brown color in the crust, and for the filind to be set and bubbling over, not watery looking. Be sure to let the pie cool for at least an hour before slicing and serving. Thanks so much to Emily & Melissa Elsen for their time and generosity with words, photos, and recipes. After this teaser I'd better get to Brooklyn to try a slice o' Four and Twenty Blackbirds pie soon.